The lowdown: The son of a former Colgate football player (Jim) and a 1,000-point basketball scorer at King’s College (Maureen), Connor was a Pennsylvania Mr. Football award finalist and high school All-American player and a big-time recruit for the Nittany Lions. He stepped right in as a freshman starter at right guard and became the first offensive lineman to be named Big Ten Freshman of the Week and just the third offensive lineman to win any kind of Big Ten weekly award. McGovern moved to center as a sophomore and started games at both positions (one at center, 13 at right guard) in his junior season before declaring early for the 2019 NFL draft. He said at the combine that he has played all five positions in practice at Penn State. McGovern is a heavy-handed, well-proportioned blocker who works well on the move. He can be seen regularly working up to the second level in the run game and was a critical piece of Penn State’s spread run game with QB Trace McSorley and RBs Saquon Barkley and Miles Sanders. McGovern can hit moving targets, positions himself well with good footwork and has a nice finishing ability. Although he did not compete in the full battery of tests at the combine, he projects to be an above-average athlete as an interior blocker who might be best in a zone-heavy scheme. There are holes in his pass protection, as he will sometimes fail to get his hands inside of defenders and can struggle to pick up line stunts and twists (see the Michigan game last fall) quick enough. Most of that is likely due to his relative inexperience, which could be coached out of him. McGovern has the earmarks of an early NFL starter at any of the three interior positions – a high-floor, medium ceiling prospect who will make his unit better in time. He might not dominate early, but McGovern should be a good player for years to come. Yes, we’re rooting for chaos: the Broncos having two guys on their offensive line named Connor McGovern. 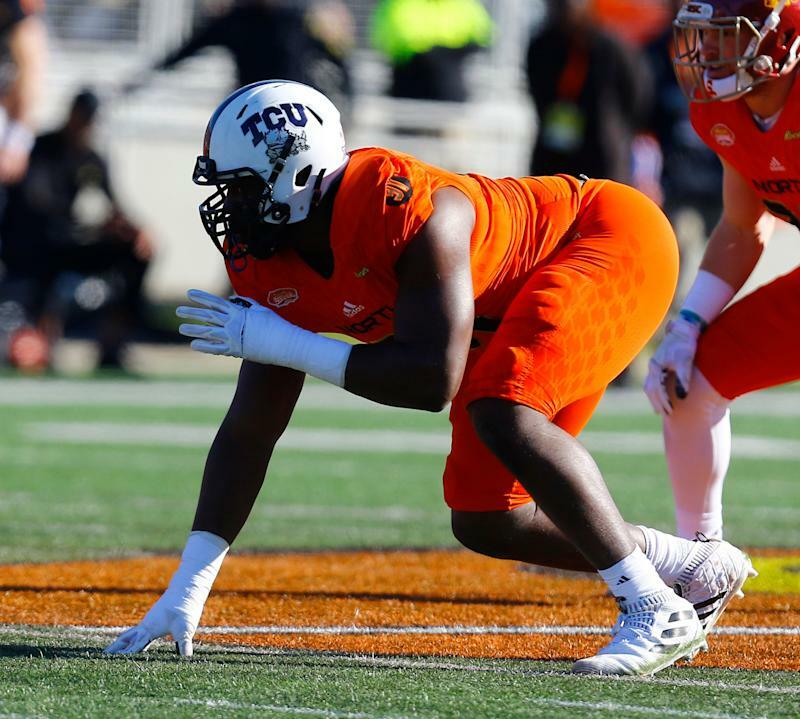 The lowdown: A late bloomer who only really emerged as a starter in his final season at TCU, Collier worked his way up from being a solid contributor early to being one of the best defenders in the Big 12. There’s a debate in scouting circles over whether Collier or teammate Ben Banago is the better NFL prospect, but we’re going with Collier, who has been on an upward trajectory since his Alamo Bowl game against Stanford to cap the 2017 season, through a first-team all-conference senior season and a standout week at the Senior Bowl. Even as he sometimes struggles to bend the edge as a pass rusher in one-on-one drills, Collier was one of six players named to Senior Bowl director Jim Nagy’s “All-Nasty/Dog” team for their practice intensity. Collier works hard and works the angles to disrupt up front, using strength (devastating hands), strong balance, aggressiveness and subtle technique work to win a lot of battles. Again, speed is never going to be his game, so Collier won’t be asked to rip around tackles’ outside shoulders to get sacks. He has too slow a get-off and not enough twitchiness (poor shuttle and 3-cone drill times) to be that player. Watch the West Virginia game, and you’ll see that quicker-footed blockers (OT Yodny Cajuste and even TE Trevon Wesco) can neutralize Collier. But if you’re looking for a country-strong, intense tone setter with long arms and a thick base who can handle multiple responsibilities up front, Collier might be a very serviceable pro. He can work as a base end and even kick down inside and mix it up in traffic, projecting as an excellent run stopper and edge setter. Collier played the 2018 season at closer to 270-275 pounds. Fun fact: Asked by musiccitymiracles.com which quarterback he’s most looking forward to sacking, Collier chose someone he couldn’t take down in college – Cleveland’s Baker Mayfield – when they faced off when Mayfield was at Oklahoma in 2017. Collier technically didn’t register a sack in that game, even though he tackled Mayfield after a short scramble. Last season, Miller started only four games but was a defensive regular in turning in an 8.5-sack senior year. Miller was forced to sit out the national championship loss to Clemson as well as the Senior Bowl with a hamstring injury. He also participated in only the jumping drills at the NFL scouting combine as he worked his way through rehab, and missed portions of Alabama’s first pro day. He’s expected to run a 40-yard dash and do other drills at Bama’s second pro day on April 2. He’s an angular rusher who needs development and might not be instant coffee in the NFL. But with the careful cultivation of a strong coaching staff, Miller could be a high-ceiling prospect. He has double-digit sack potential but might never be a completely well-rounded defender. Although his hand use and burst give him a chance to be very good, Miller will have limitations and must overcome his injury-prone reputation to be successful. Fun fact: He’s the son of former New York Giants and Minnesota Vikings linebacker Corey Miller, who attended South Carolina. Christian chose Bama over the Gamecocks, but because of injuries and scheduling he never played against his father’s alma mater. Corey had hosted a local radio show in Columbia, South Carolina, but quit the job after many people were upset with his comments after his son chose to play football elsewhere. The lowdown: Elgton (pronounced EL-ton) might be one of the more battled-tested and versatile blockers in this year’s draft class as he started games over the past four season at four different positions (everything but right guard) and faced some of the best competition in the SEC (and squaring off at practice against teammate Jeffery Simmons, one of the 10 best prospects in this draft class). Among his 49 career games with the Bulldogs, Simmons made 34 starts – 26 at center, five at left tackle, two at left guard and one at right tackle. Interestingly, Jenkins was left off the SEC team awards list this past season but was lauded by his teammates and NFL scouts for his intelligence and twice made the SEC All-Academic team. He also allowed only one sack (762 pass-blocking snaps) at center over his final two seasons combined, per Pro Football Focus, and committed only one penalty as a senior. Jenkins projects to being a starting center or guard in the NFL who could pinch hit at tackle in an emergency. Jenkins might not have the raw upside of a few of the other interior OL prospects in this class. He’s more of a bump-and-steer blocker than a dominator, and has natural athleticism, quality base strength and decent enough movement skills to merit a Day 2 draft pick. One scout said his team was concerned with the snap-count issues Jenkins and his team had at Alabama, but felt better about it after talking to Jenkins and still considers him able to handle playing center in noisy environments. A bit of an older prospect, Jenkins will turn 24 at the end of his rookie season in the NFL. Fun fact: A three-star recruit, Jenkins didn’t receive an offer from a Power 5 school until three days before Signing Day in 2014. It was from the Bulldogs, and he didn’t hesitate to accept. The lowdown: Nelson is a long-bodied, power edge player who collected 31 sacks in three seasons. He uses his nearly 35-inch arms to keep blockers at bay and also close down passing lanes. NFL evaluators did not sound alarms when Nelson managed only 18 reps on the bench press at the scouting combine, in part because of his arm length but also because of his stellar all-around workout. In addition to strong positional work, Nelson impressed in the athletic testing drills – good to excellent in everything. Turning in a 6.95-second 3-cone drill at his weight stunned a few observers. Nelson has the tools and football makeup to be a three-down end in the NFL. He might never be anything close to a classic edge rusher, lacking the ability to bend the corner, but he’s a leg-churner who doesn’t curl up when his first pass-rush move is stymied. Most of his sacks come on effort and power. 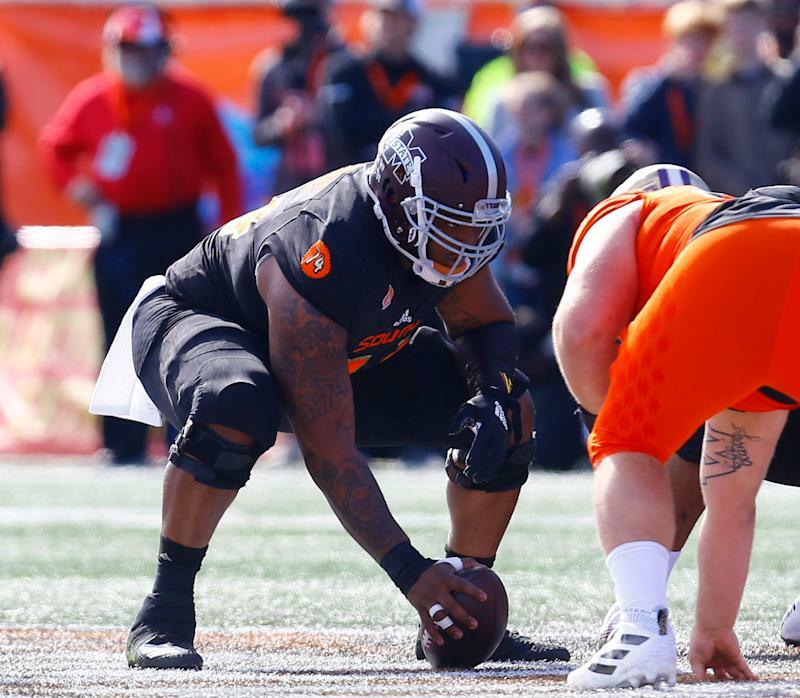 Tall rushers in Nelson’s mold can be met with mixed responses in NFL circles, and a quiet week of practice at the Senior Bowl didn’t help Nelson’s stock, but he has enough positives to project as a base end who can kick down inside and still be effective. 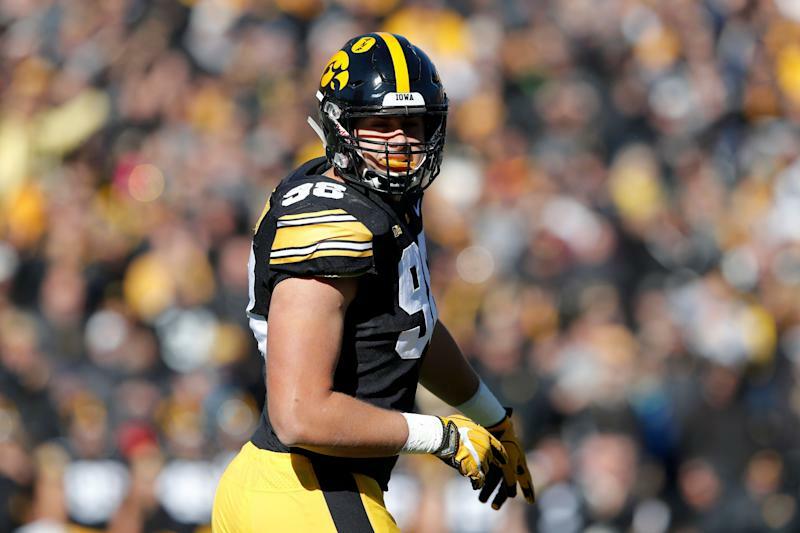 Fun fact: Anthony’s father, Jeff Nelson, was a defensive lineman at Iowa in the late 1980s and early ‘90s, but the Hawkeyes didn’t offer a scholarship to Anthony – the Class 4A Western Iowa Defensive Player of the Year – and he initially committed to rival Iowa State. After Iowa offered him late in the process, Anthony flipped to the Hawkeyes. He won all three matchups against the Cyclones and notched 2.5 sacks in those games. The lowdown: The tiny-framed Singletary is a fascinating prospect from a tangibles standpoint in that his ordinary testing numbers at the scouting combine raised legitimate questions about how he fits into the NFL. His collegiate production speaks for itself, with 4,287 rushing yards and 67 rush TDs during his career with the Owls. Runners his size typically need to excel in other areas as well, so Singletary’s lack of returning experience (13 kick returns as a freshman) and limited role in the passing game (51-397-1 receiving in 38 career games) complicates his evaluation even more. Here’s what defines his game: incredible balance, toughness, short-area burst and ability to navigate tiny cracks in the defense. Singletary has some real grit to him, and he almost never lets a shoulder tackle bring him down. What he lacks in raw, straight-line speed, Singletary makes up for with some vicious cutting ability and great vision to get into the open field. At least once a game he can be seen freezing defenders and making them look foolish with that cutting ability. Singletary also puts in excellent effort as a pass protector, and he’s considered a far more effective pass catcher than his 2018 season totals (six catches for 36 yards) might suggest. A good comp for Singletary might be Dion Lewis, who was a bust with the Eagles, a brilliant reclamation project in New England and an afterthought in his one season with the Titans. Singletary has a bust factor to him, no question, but creative coaches will find a way to utilize his talents. Fun fact: Singletary was nicknamed “Motor” by his father, Devonn, who first was called that himself in his youth football days. Devonn realized that his son deserved the nickname because he wouldn’t quit no matter how hard anyone pushed him to be great. The lowdown: Oruwariye shockingly has a chance to be the highest-drafted Penn State defensive back ever. The Nittany Lions have never produced a first-round pick in the secondary, and just two second-rounders since 1936: Kim Herring (58th overall in 1997) and Bryan Scott (55th in 2003). The press corner actually earned second-team all-Big Ten mention despite not starting a game in 2017, and Oruwariye elevated to first-team honors in a three-pick senior season. Oruwariye has a big frame, but his arm length (31 3/8 inches) falls below the 32-inch threshold that many press-heavy teams seek in their corners. He also has smaller hands (9 inches) and lacks true makeup speed if he’s beaten off the line. (Even so, he helped himself out significantly by running a very good 40 time of 4.47 seconds at the combine.) Oruwariye overall has a good athletic profile, though, and competes hard, able to support the edge as a run defender and also be effective against big receivers versus 50-50 balls. His route recognition and ball production both took big jumps the past two seasons as he became a regular. Oruwariye might not be a great fit in a heavy off-man system, but he could work well in a Cover 3-type defense used heavily by the Seattle Seahawks and the many Pete Carroll coaching tree members around the NFL. Fun fact: Prior to Penn State’s home game against Iowa, the school honored Oruwariye’s mother, Karen, who served in the Navy for 15 years, on Military Appreciation Day at Beaver Stadium. The cornerback honored his mother by running out of the tunnel during the pregame and delivering an American flag to her at midfield. The lowdown: The jump-ball specialist is a thick-framed, long-armed, second-gear receiver who won’t fly by corners but he can outleap them for big plays downfield. Attacking the ball the same way Charles Barkley went after rebounds, Arcega-Whiteside totaled 28 touchdowns in his 33 career games for the Cardinal and averaged 16.4 yards per catch over his three seasons despite less-than-great speed. He had foot surgery after the 2018 season, which prevented him from doing anything except the bench press at the NFL scouting combine. NFL teams believe Arcega-Whiteside would have run in the 4.6- to 4.7-second range, so they have a good feel for what he is and know his game isn’t speed-dependent. So often it was obvious who was getting the ball for Stanford in key situations – third downs, red zone, fourth quarters – and yet Arcega-Whiteside came up with the play his team needed more often than not. He boxes out corners and can push the boundaries of how physical a receiver can get, and yet he also exhibits great body control and ball-tracking ability. His lack of separation ability off the line is something that’s concerning, and he might not fit the growing trend of putting big receivers in the slot. Arcega-Whiteside can be a little stiff and mechanical in his route running, but there’s a role for a team that doesn’t ask him to try to win battles with his quickness. He’d be a great option for a team such as the Bills, for instance, to go win 50-50 battles with strong-armed (but sometimes inaccurate) QB Josh Allen. Fun fact: J.J. actually stands for Jose Joaquin, as he’s the Spanish-born son of two former pro basketball players. And J.J. has a little hooping ability, too, earning all-state in basketball in South Carolina, in addition to being terrific at football, and track and field. The lowdown: No, we’re not trying to compare Saquon Barkley to Sanders. Barkley is a rare talent and more physically gifted, but you might be shocked to find out that Sanders totaled 3 more rush yards in 2018 than Barkley, the No. 2 overall pick in 2018, had in his final season at Penn State. And yet there has been shockingly little draft buzz for Sanders in the media and among fans until just recently. Rest assured, NFL scouts are very much aware of his abilities and is well-regarded, even if it is a bit of a down year for RB prospects. One of the biggest knocks about Sanders has been his shockingly high fumble rate, putting the ball on the ground on 2.88 percent of his touches. For context, that was the highest rate of any of the 28 backs invited to this year’s scouting combine, and the next closest was more than a percentage point below: Ohio State’s Mike Weber (1.74 percent). Still, this is viewed as a correctable trait by confident NFL coaching staffs. Sanders catches the ball pretty well, but his blocking has come under some scrutiny. Still, there should be a role for him with his very good balance, shiftiness and ability to hit some doubles and triples through small windows. Fun fact: Sanders’ mother, Marlene, asked her 7-year-old son what he wanted to be when he grew up. Sanders sat down and drew a picture of Jerry Rice and wrote “NFL” on the piece of paper. Now his dream is within arm’s length – and he hopes to reward his mother for everything she has meant to him. The lowdown: The transformation of Isabella from high school track standout to NFL prospect is one of the 2019 NFL draft class’ best stories. He has always been fast – see the “Fun fact” section for proof of that. But he was a completely unrefined route runner, coming from a high school where he was a 5-7, 170-pound running back. UMass was the only FBS school to offer him, and it took a bit for Isabella to get acclimated. But after a season in which he was mostly used as a special-teamer, Isabella emerged as the Minutemen’s deep threat the past three seasons. Over his final 36 college games, he totaled 229 receptions for 3,519 yards (15.4-yard average) with 30 TDs, also rushing 40 times for 342 yards and two scores as a gadget weapon. Incredibly, in 2018, Isabella accounted for 47.4 percent of UMass' receiving yards, and he did so with the team cycling through three different quarterbacks (one a lefty). The highlight of his season was a 15-catch, 219-yard, two-TD showcase game at Georgia in which the Bulldogs used three different cornerbacks to cover him, including possible first-rounder DeAndre Baker. After Isabella’s final college game, Georgia players shook his hand. Isabella comes prepared after working in a pro-style offense in college, and he was said to have absorbed Jon Gruden’s playbook quickly at the Senior Bowl, where his blazing speed was obvious from the first day of practice. Getting off press coverage will always be a concern. He’s a bit of a body catcher and he could find himself mostly in the slot in the NFL, but his excellent toughness and burst could serve him well there. Isabella has been preparing with Hall of Fame receiver Randy Moss to help train for the draft. He has been lazily compared to Wes Welker and Julian Edelman, but those comps ignore Isabella’s blurring speed and vertical ability. Style-wise, he’s more like the Buffalo Bills’ John Brown or the Indianapolis Colts’ T.Y. Hilton, both whom had to overcome size and small-school stigmas coming out of college. But as NFL scouts will tell you, speed always translates. Fun fact: Isabella, who ran a 4.31 40 at the combine, once beat Cleveland Browns first-round pick (fourth overall) Denzel Ward in 100- and 200-meter races in high school back in Ohio, winning the state championship in those events. 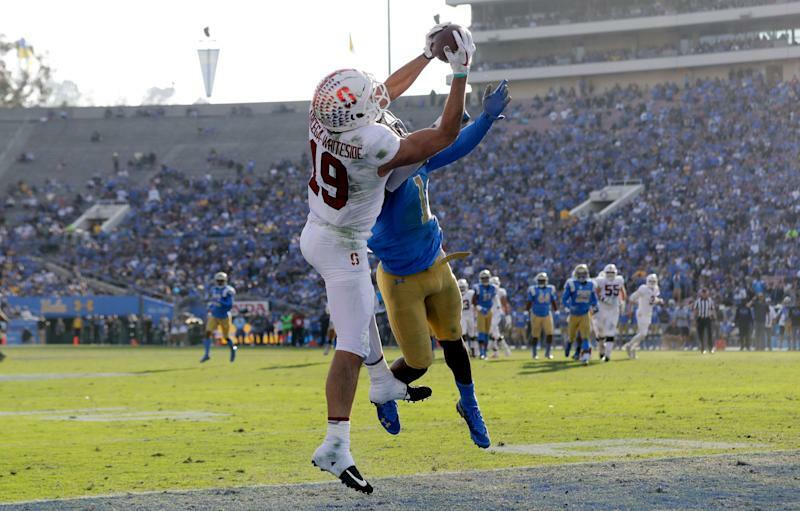 Andy Isabella isn’t going to be pegged by the annual white wideout stereotypes. He’s actually fast. Draft range: Timed speed such as Isabella’s typically doesn’t get out of Round 2, but we could see him slipping to Round 3 because of his lower level of competition.